About: The Valley Hospital is a fully accredited, acute care, not-­for­-profit hospital in Ridgewood, New Jersey. Valley has earned 13 Disease -Specific Certifications (also known as Gold Seals of Approval®) from The Joint Commission. The Need For Improvement: Like most healthcare organizations, The Valley Hospital had always struggled with early identification of sepsis, both in the ED and on inpatient floors. Motivated by the Institute for Healthcare Improvement’s 100,000 Lives Campaign, Valley’s leadership assigned advanced practice nurses (APNs) and quality assessment staff to track specific conditions and evaluate patients. When Valley moved forward with MEDITECH’s EHR, the hospital’s leadership team recognized the potential for a new electronic surveillance tool in helping clinicians with the early detection of sepsis and accepted the opportunity to be an early adopter. Execution: Participating in agile development and proper implementation processes enabled Valley to collaborate with MEDITECH on a real‐time monitoring system, which simultaneously analyzes clinical and demographic data from throughout the EHR. Using rule logic grounded in evidence‐based medicine, the surveillance system detects subtle changes in a patient’s condition that care teams may miss, alerting clinicians and providing guidance for the timely initiation of sepsis care. 93% VTE prophylaxis compliance rate, a dramatic improvement from the low 70’s. Surveillance has emerged as the Valley IT department’s first choice for hospital‐wide problem solving. Clinicians are confident that the solution is identifying conditions, providing relevant data, and expediting ordering to initiate treatment sooner. 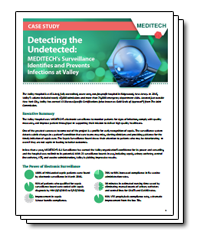 To learn more about what The Valley Hospital has accomplished with MEDITECH Surveillance, download our full case study.